After too many years of failed experiments with beans, I was delighted to plant several dozen seeds into the inaugural raised bed. Bush, Pole, and Black-Eyed Peas — all of them! The Hurricane loves snapping beans nearly as much as eating them, and sitting on the porch, snapping beans, has to be one of my fondest childhood gardening memories. Strangely, they all seemed pretty happy and it looked like they just might make it onto the porch and onto a plate. Until a raging thunderstorm blew through, leaving all sorts of house-related drainage problems in its wake as well as cruelly snapping bush bean limbs from their trunks. 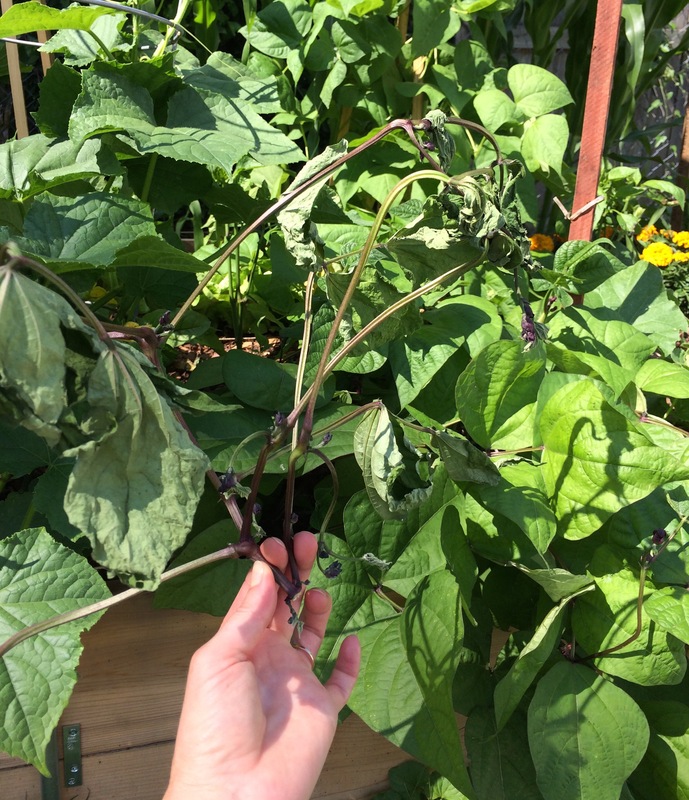 These Royalty Purple bush beans are scattered throughout the 4×8 raised bed and were planted on a 15-day staggered schedule. They’re packed in pretty tight, six to a square foot, to provide support for one another and shade for the pods on hot summer days. Still, the winds whipped a little too hard for the earliest seeded Royals, taking up real estate at the south/front edge of the bed. So, Hey Self: next year remember to plant the bush beans along the penultimate/northern row of the bed. Allowing sturdier, shorter plants to offer some shelter from the storm. Besides, it’s good form to rotate from year-to-year.